Using a treadmill is an effective way to get in a workout when the weather is not conducive to outdoor running or walking or if you prefer to run on a softer surface. Many motorized treadmills offer the bonus of being able to select precise speed as well as the incline of the deck, which allows you to simulate climbing a steady grade. While running or walking uphill is more taxing than walking on a flat surface, it offers a unique benefit in that it allows you to get your heart rate very high without requiring you to move at high speeds. This reduces your impact stress. In addition, running hills outside requires you to repeatedly jog back to the bottom from the top. Often on asphalt, these factors not only subject your legs to greater stress, but interrupt the climbing portion of the workout as well, which isn't an issue on the treadmill. 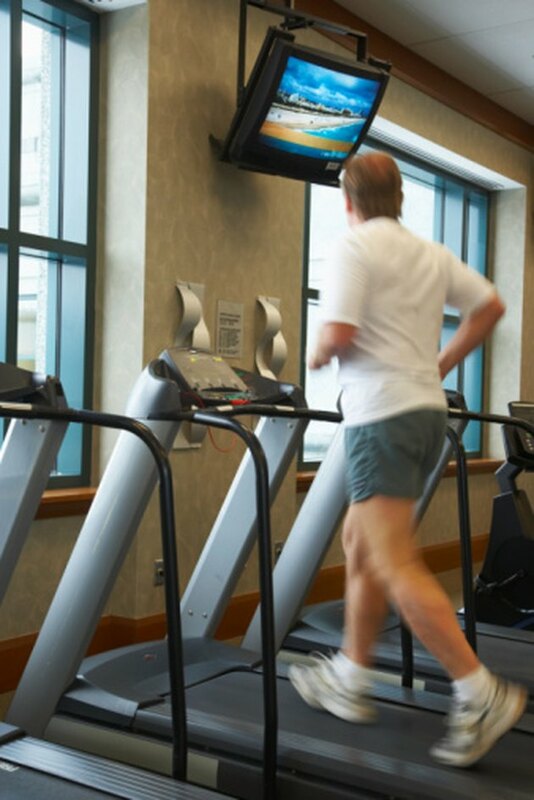 Most treadmills can be set to at least a 10 percent grade, usually in increments of one degree, but in some models, they can be set in increments of one-half degree; some models allow for a 15 percent grade. For reference, the maximum permissible grade on most Interstate highways is 6 percent, while the average grade of the 7.6-mile Mount Washington Road Race, one of the most popular uphill running races in the country, is about 12 percent. For most people, running form deteriorates markedly at inclines greater than 10 percent, while 5 percent is generally challenging enough for moderately fit runners and walkers. Unless you spend time reliving your high-school geometry days, the term "percent grade" may not mean much. But, you may recall the concept of slope, which is simply "rise over run," or vertical distance climbed divided by horizontal distance covered. For example, if you walk up a ramp with a 40-foot base and gain 10 feet in the process, the slope is 10/40 or 0.25. To convert to percent grade, simply multiply the slope by 100. In this example, the percent grade is thus 0.25 x 100 = 25 percent. Moving from geometry from trigonometry, the slope is also the same as the tangent of the angle of elevation. This means that tangent of A = (rise/run), or inverse tangent of (rise/run) = A, where A is the angle of interest. If you wanted to find the angle of elevation of a 15 percent grade with a calculator, you would find the inverse tangent of 0.15, which turns out to be about 8.5 degrees. On the other hand, if you know the angle is 10 percent, you simply find the tangent of that angle, which turns out to be .176, which yields a percent grade of 17.6. Therefore, a 10-degree incline is slightly higher than you are likely to experience on a standard treadmill. If you are loath to do calculations, there are degrees-to-grade conversion charts available online (see Resources). What Is the Standard Size of a Stair Step?